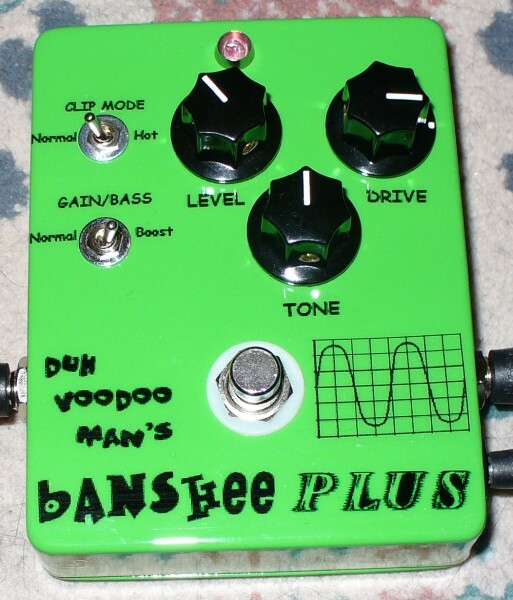 The Banshee PLUS is my third iteration on the BYOC Overdrive TS-808 clone design, and its capabilities fall in between the jazzed up Zonkin' Yellow Screamer and the "plain vanilla" Screamin' Banshee. It's got all the latter's capabilities, "plus" a few more, hence the pedal name. Where the ZYS offers 18 different combinations of gain range, bass rolloff frequency and clipping mode and the Screamin Banshee just one, the Banshee PLUS has four. One toggle switch lets the user set the gain range and bass rolloff to either stock TS-808 levels (the "normal" setting) or to a boost setting that increases maximum gain by a factor of over four while dropping the bass rolloff by more than half, substantially increasing bass frequency output. The second toggle switches between a stock TS-808 symmetrical silicon diode clipping mode and "TS-on-steroids" yellow LED clipping. 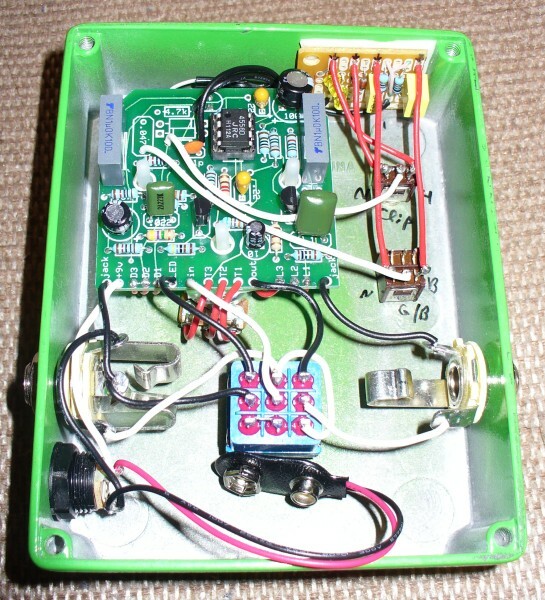 The switchable components for these two mods are located off the PCB on a small piece of perfboard mounted to the inside of the pedal enclosure. While I might have been able to jam all this into a 125B sized pedal casing, I opted instead to make life easy and use the roomier 1590NS box. As you can see in the photo below at right, there's quite a bit of room inside the enclosure.